The versatile ceiling fan can enhance your home's comfort, beauty and overall value, plus they save energy too! They're well worth the cost and are available in a huge variety of options ranging from understated varieties to ones that more closely resemble a chandelier. No matter what space you'd like to put a ceiling fan in, you're sure to find the perfect match, but here are a few things to keep in mind. Are you going to install this ceiling fan in a very small bedroom or a grand living room? You need to keep fan sizing in mind. If you get a fan that's too big for the space, then it will overwhelm the room. If you get a fan that's too small for a space, it won't do its job effectively. This video from our brand Kichler can help you get the right size fan! Find the square footage of the room you're considering (measure the length and the width of the room, in feet, and then multiply the two numbers together) and then match it with these general guidelines. Another way to look at it is this: Small fans of 36" or less are good for rooms of about 6 by 6 feet or smaller. This includes rooms like bathrooms, breakfast nooks and utility or laundry rooms. Medium fans of 37-48" are good for rooms of about 10 by 10 feet. This includes rooms like bedrooms, kitchens and dining rooms. Standard-size 49-55" fans are good for 12 by 12 rooms. This includes rooms like larger bedrooms, family rooms and media rooms. Large 56"+ fans are good for rooms of 15 by 15 feet and larger. This includes rooms like great rooms and other large spaces. Along with a wide selection of indoor ceiling fans, you can find outdoor ceiling fans that will transform your outdoor spaces into the place to be! But if you're going to put a ceiling fan in an outdoor space, make sure to purchase a fan that is designed especially for outdoor use. They are made with more durable materials and can withstand the elements, whereas indoor fans will succumb to humidity if they're installed outside. 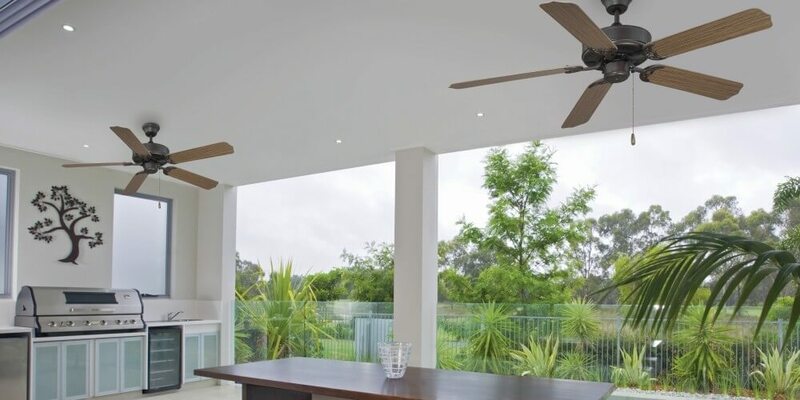 There are two different grades of outdoor fan: damp rated fans are suitable for use in covered outdoor areas, like porches and patios, while wet rated fans can be exposed directly to rain, so they are good for use in gazebos or pergolas. Keep your local climate in mind when choosing outdoor solutions. Do you have an elegant, traditional style home? Is your abode adorned in cutting-edge contemporary looks? Do you just want a ceiling fan with a design that isn't too fussy, but still looks nice? Are you not even sure what you want? Don't worry. We have ceiling fans to suit any space and style. Here are some design touches that can help you identify your ideal ceiling fan style. Traditional: This style often features decorative flourishes in areas like the light kit, fan blade arms and fan motor housing. Transitional: This style, while similar to traditional, usually tones down the decorative flourishes for a more versatile look. Contemporary: Contemporary ceiling fans are typified by very inventive and unique styles, often through using LEDs. 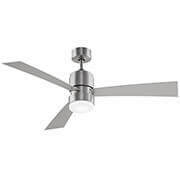 Other looks, such as tropical ceiling fans or coastal ceiling fans, are available too. These are just the 3 most common decor styles. Some ceiling fans are sold as an all-in-one package, whether with or without lights. 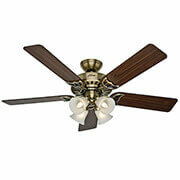 Some are sold as separate parts and allow you to customize with your choices of ceiling fan blades and light kits. You can adjust how low or high your fan hangs by using downrods. Do you have a high ceiling? Consider adding extra downrods so that the ceiling fan hangs low enough to cool you instead of your ceiling. The recommended hanging height for a ceiling fan is 7 to 9 feet. Do you have a low ceiling? You may want to look for what is called a hugger ceiling fan. Aside from having a cute name, hugger fans are notable because they have a design that keeps them close to the ceiling by not using downrods. Some ceiling fans can be used in hanging or hugger style, too. Make sure that your downrods match the finish of your fan and come from the same brand as the fan. Plus, you can get ceiling fan controls: wall switches or remote controls! Just remember that most ceiling fan accessories are only meant to be used with fans from that same brand. So, make sure your accessories match your fan--Fanimation accessories with Fanimation fans, Savoy House accessories with Savoy House fans and so on. Trying to pick the perfect finish for your ceiling fan? Try identifying the most used color of wood in the room, like the flooring, and pick a fan that uses blades of that color. Then pick out the most used color of the metal hardware in the room, like doorknobs, and get a fan that has that finish too! 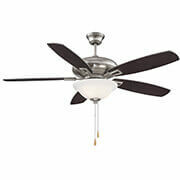 Alternately, some people prefer white ceiling fans in order to blend in with a white ceiling. Have you thought about efficiency? Most ceiling fans can save you money on cooling and heating! In winter, reverse the direction of the fan to push warm air down towards the room's occupants. However, one important thing to remember with ceiling fans is that they do not actually change the temperature of the room. They just provide a breeze. They do it very well, but that's what they do. So, when you're not in the room, turn off your ceiling fan. You can learn more about how efficient a ceiling fan is by reading its Ceiling Fan Energy Guide. When you think about efficiency, something important to consider is airflow. How much air can the ceiling fan move? That's determined through the quality of the ceiling fan's motor, the pitch (or angle) of the blade and the blade's material. For a residential fan, the best pitch is 14 degrees because it provides the most airflow. The best materials for blades are laminates and not solid wood because laminates resist warping and are stronger than solid wood. Speaking of the best materials, the quality of the motor is really what you're paying for in a ceiling fan. High-quality motors are encased in heavy-gauge steel, so they're quiet, less prone to rattling and will last a long time. Plus, they tend to look better visually! To browse our collection of ceiling fans, click here. When you're ready to install your new fan, click here for step-by-step instructions. Need more advice? Contact us or give our trained lighting specialists a call at 1-866-688-3562. Sign up for our email newsletter today and score an additional discount!